Aaron Neuwirth reviews Mortal Engines, a Peter Jackson-produced adventure that takes a science fiction story and goes big with it. An initial glimpse of Mortal Engines had me intrigued. With no knowledge of Philip Reeve’s book beforehand, I saw a massive mobile city being chased by an even bigger one and realized I hadn’t seen that before. If producer/co-screenwriter Peter Jackson was going to deliver Howl’s Moving Castle by way of Mad Max: Fury Road, I wanted to know how that would shake out. After two hours of seeing how this post-apocalyptic steampunk adventure went, I can say there’s a lot that I liked. Mortal Engines doesn’t quite cross the finish line in mint condition, but for all its issues, I still kept thinking the same thing through much of the runtime: Just go with it. It’s the scale that sets this film apart and is what piqued my interest. 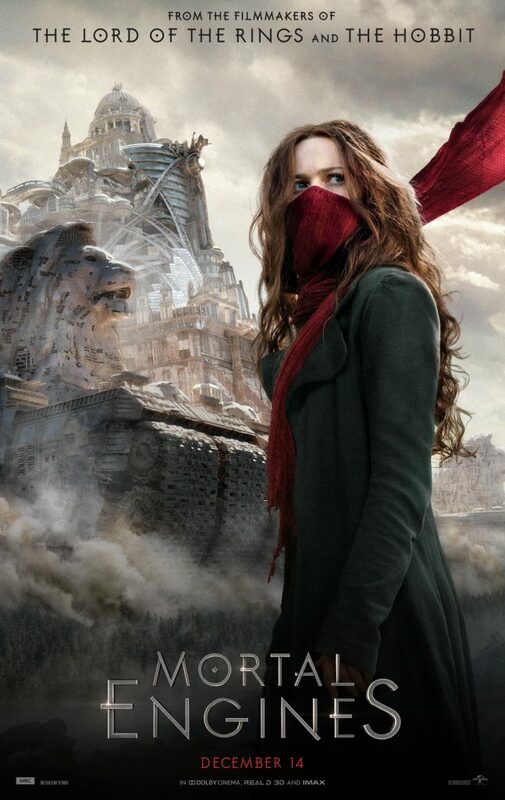 Set thousands of years in the future, Mortal Engines shows what the world is like after the “Sixty Minute War,” where powerful weapons caused massive geological upheaval. Now we have massive cities on wheels that operate under a philosophy known as “Municipal Darwinism,” where larger cities hunt and absorb the smaller ones. Hugo Weaving is Thaddeus Valentine, who basically controls London, and desires power over the world around him. Despite having a killer name, Valentine is a clear symbol of imperialism at its worst. As the book hit shelves back in 2002, it is easy to think of the political connections to that period, however, given what we see in regards to the populations of these various cities (the higher and lower classes), one can take the ideas presented and apply them to today as well. It may not be as prescient as Children of Men, but Mortal Engines certainly has more on its mind, beyond spectacle. However, the spectacle is what most are coming to see, and this film delivers. Director Christian Rivers has been a visual effects guru and storyboard artist for Jackson since he was 17-years old (the wonderful romantic zombie comedy Braindead is the first film Rivers is credited on). For his directorial debut, Rivers certainly does excellent work in delivering the sense of scale so crucial to understanding what separates this film from others like it. More could have been done to imbue the picture with a stronger sense of identity, but in terms of working with the team at Weta Digital, the effort to make this film come alive visually was undoubtedly on the minds of all involved. The story is relatively boilerplate, doing just enough to remain a cohesive experience. I will give Mortal Engines credit for not stacking on too many concepts and characters at once, as the film is happier to throw audiences into this world and stick to primal motivations to keep things moving. This is a familiar adventure story, where a mysterious heroine, Hester Shaw (Hera Hilmar), wants revenge on Valentine. Circumstances have her partnered with a comedic sidekick/love interest, Tom (Robert Sheehan), as the journey to London takes them to some wild locales on the way. While not overstuffed, credit does go to letting the film embrace some sense of diversity, not to mention having women dominate most of the action scenes. Yes, the leads are as white as they can be (we are dealing mostly with stuffy Brits after all), and having Valentine’s daughter (Leila George) and another side character involved feels almost like an afterthought, but others have their time to shine. This mainly comes in the form of resistance fighter Anna Fang, played by Korean pop star Jihae. While not exactly matching the charisma of the scoundrel types who inspired this performance, one can certainly see what’s being attempted with the look and function of this character. Other resistance members fit a similar mold as well. I couldn’t tell you any of their names offhand, but they had some neat costumes to fit well with the production design around them. Of course, anyone that sees this costly film will walk away knowing Stephen Lang’s Shrike is the most interesting character in the movie. This is the robot made out of emotions I had referred to earlier. A re-animated person, constructed from machine parts. 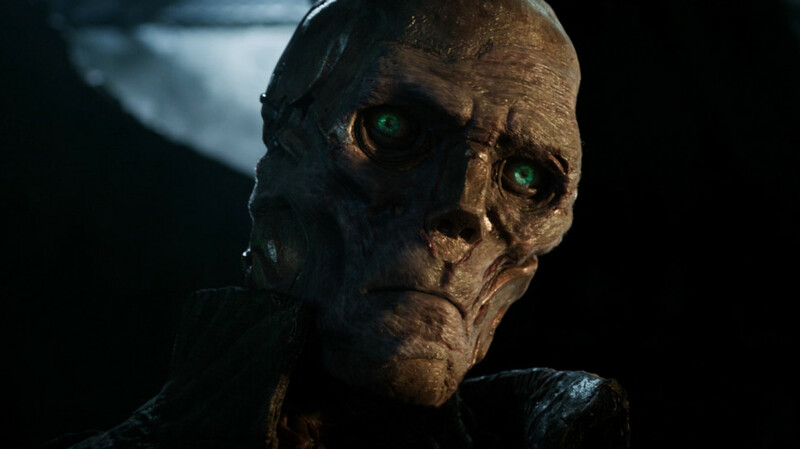 The visualization of this character is quite impressive, and how the film chooses to deal with whether or not this thing has a soul is the kind of element that has me looking forward to catching up on some expanded media to learn more about how Shrike works. It’s a shame Mortal Engines doesn’t rise to a higher level regarding overall quality. I can give praise to the aspects I enjoyed all I like, but it is easy to see how this film falls short. For whatever reason, Jackson, his partner Fran Walsh, and frequent collaborator Philippa Boyens tend to be hot and cold in their writing. Dialogue is often clunky, regardless of how clear the story and plot motivation may seem. Certain pairings feel underserved when it counts. For a film that relies heavily on world building, I wish I could have appreciated those living in this world more. Even with a strong emotional core, this story could have used more fuel to keep all the parts moving more efficiently. I will say the story at least dares to contain a beginning, middle, and end, rather than tease out ensuing adventures, without wrapping up this first one (there are three more books). It’s already a risk to make an outrageous film like this, so good on Jackson for knowing how to control it. Mortal Engines owes plenty to other science fiction adventures, and it says a lot that the robot is the most human aspect of this story. However, Rivers has done a fine job of showing me something big and ambitious. This is a huge movie. It has stunning effects impressive enough to have it made fun of by those who choose to pick apart everything, instead of embracing take in the inherent silliness of a film like this. Even when the movie comes up lacking, I always found something interesting to look at in every frame. Call Mortal Engines frenetic or ridiculous, but it’s never dull.